The ever popular Baldivis Country Fair is on again for 2014. 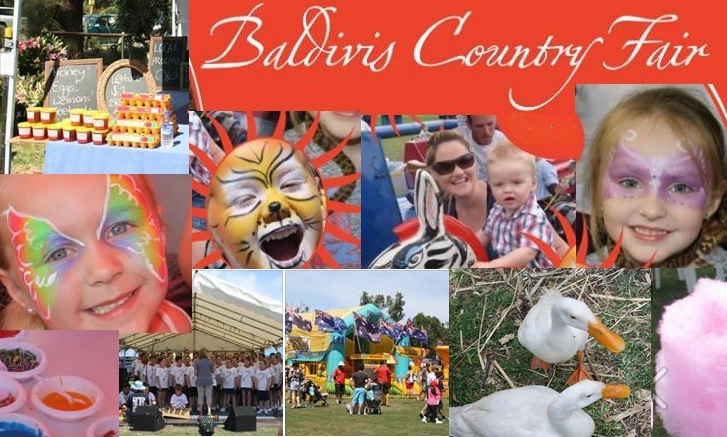 This year the Baldivis Country Fair will be held on Saturday 1st November, 2014, from 10am until 4.30pm, in the grounds of the old Baldivis School, located on the corner of Fifty Road and Baldivis Road. Now in its 38th year, the Baldivis Country Fair is a hugely popular community event and this year is set to be bigger and better than ever before. This event attracts around ten thousand visitors each year, and gives everyone the opportunity to enjoy some old-fashioned country style fun. The Baldivis Country Fair brings together the whole community, including local sports groups, schools, businesses, social groups and individuals. The fair features an assortment of live entertainment, music, activities, market-style stalls, showbags, rides, games, farm animals, fresh produce, food, refreshments, a licensed bar, competitions, and much, much more. This fantastic annual event is organised by the Baldivis Primary School P&C, and funds raised go towards key infrastructure, teaching equipment and educational programs that benefit all current and future students of the school. So, come along to this years Baldivis Country Fair for a fun day out in a relaxed, family-friendly atmosphere, that everyone will enjoy. For further information about the Baldivis Country Fair 2014, visit the official facebook page.